Researchers from ITMO University developed a method to enhance the activity of enzymes by using radio frequency radiation. 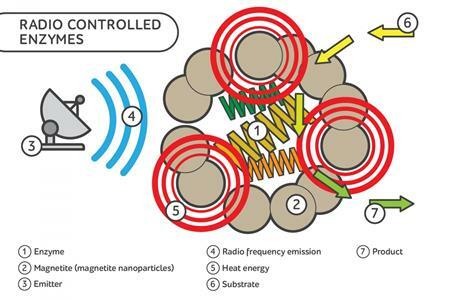 The method requires making a special complex consisting of enzymes and magnetic nanoparticles. The particles can adsorb radio emission and convert it to heat, resulting in enzymatic processes acceleration by more than four times. At the same time, the particles-covered enzyme becomes more resistant to high temperatures. Such method can be used to create radio-controlled biochemical systems, as well as to adjust metabolism in living organisms. The results are published in ACS Biomaterials Science & Engineering. “Since this topic has a lot of potential, further work will focus on using the technique with other enzymes, as well as in living cells. For example, it is still unclear whether it is possible with this method to make bacteria or cells divide more often or, on the contrary, to stop their division,” notes Yulia Andreeva, the first author of the study.